The Elevon Mixer was originally developed for Dave Griffin at Canterbury Sailplanes, with the first batch coming out of my shed in December 1997. Between then and January 2003 12,892 elevon Mixers winged their way to pretty much every corner of the planet. They were predominantly used in Flying wing foamie models, but a few found their way into combat robots, VTOL models and some other odd projects over the years. Dave Griffin sold Canterbury Sailplanes at some stage, and I stopped making the elevon mixers due to the competition getting cheaper than I could buy the components here in New Zealand. But the design was still sound, and had a good following of users who swore it was smoother and more flexible than some of the other options. With 20/20 hindsight the design had some issues. 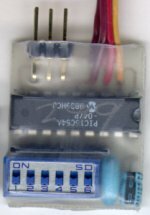 Because it used an unregulated PIC16C54 it would die with more than 6V applied to it, which led to some failures with dry-cell packs, and without signal applied some servos would 'glitch' towards full travel every second or so when the watchdog reset the processor. An Elevon mixer allows you to fly a V tail or Flying wing type model with standard two channel radio gear. So if your mortgage can't stretch to a computer radio this year, or you don't want the hassle of a mechanical mixer this unit is just the answer. The Elevon Mixer plugs into your Standard Receiver and then you plug your servos in to the outputs of the mixer. Set some DIP switches and you're flying. The Unit comes complete with a six page instruction manual, illustrated to help the first time modeller get their Vtail or Elevon Model up and flying as quickly as possible. A Computerised Mixer like this one gives greater flexibility, and reliability than using a mechanical mixer or sliding tray as quite often used in Vtail models. The Elevon mixer is also available in Kitset form. Works with all modern 1.5 millisecond neutral pulse radio gear. 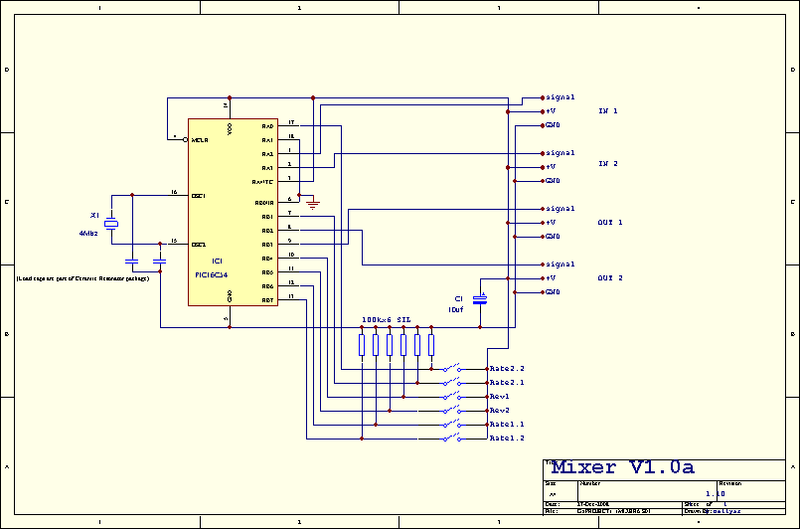 Microprocessor design doesn't need adjustment for centring. Outputs Travel limited to prevent Servo or linkage damage. Both outputs separately reversible for quick set-up. Allows 100% 75% 50% or 25% mixing of each input channel independently for flexibility. Microprocessor 'Watchdog' ensures keeps things working 100%. Simple installation, just plug in and set the switches. Gold plated output connectors for long life and sure contact. 'Universal' input leads fitted. Will connect to 99% of radio gear. Below are the files from the last version of the mixer, as it was when I had the last match made in 2003. 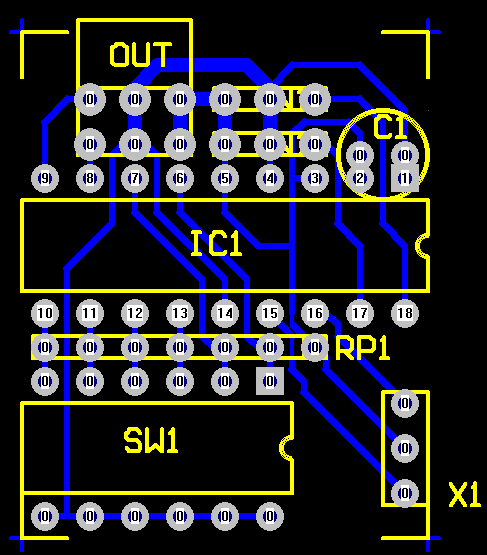 The Circuit diagram and PCB layout (the .s01 and pcb files) are from the old DOS version of protel. Many newer PCB programs will be able to open them. Alternately you should be able to find the old DOS programs on the web, a number of sites have them online. The two PNG files are screen-shots from an early version of Protel for windows, which will give you an idea. It's a pretty simple design, so the source code will give you everything else you might want to know. Speaking of source code. The .asm file is the assembly language for Version 1.06 which was the final version, and the .hex file is the assembled file for a PIC16C54a. The .asm file was written for the Parallax mpasm assembler, not the microchip one. From memory there were some syntactical differences, but it should be pretty straight forward to convert it if you're that keen. Parallax no longer do PIC programmers or support mpasm as far as I know. These files are provided for personal use only, and I don't guarantee they will do anything apart from take up space on your hard disk! See my disclaimer. I do still have a small number of the PCB's and PIC16C54's, drop me an email if you're interested. First in first served. :-).